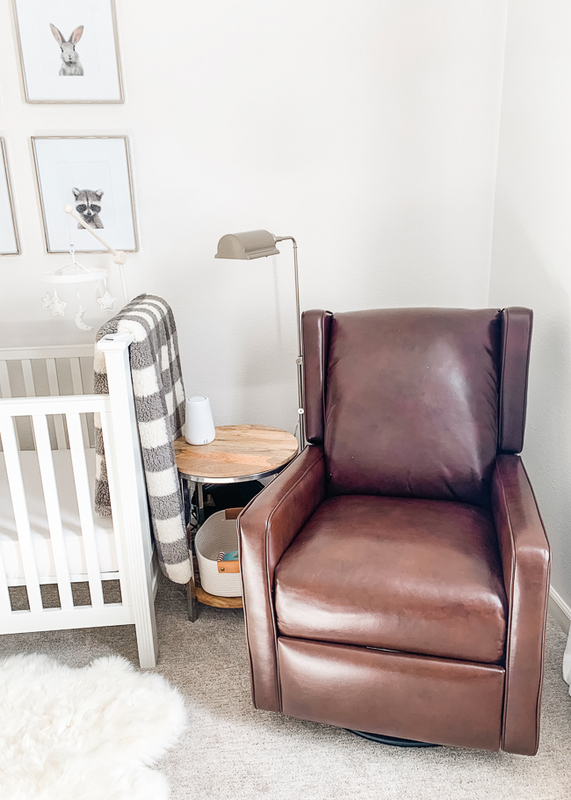 Guys, I am SO excited to finally be sharing one of my favorite labors of love throughout my pregnancy: Hudson's nursery! 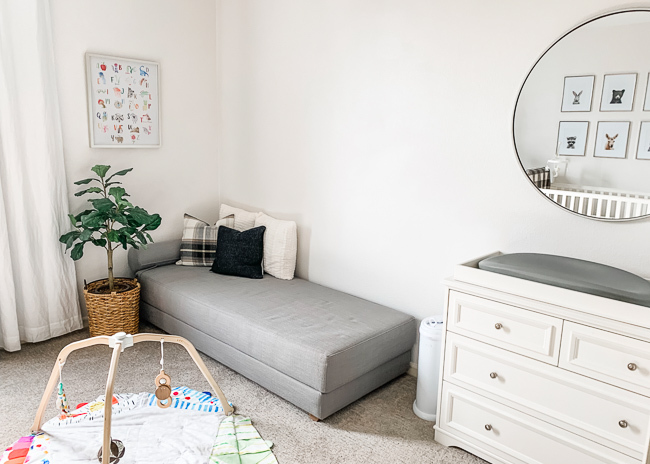 I wanted his space to be clean, simple, comfortable, and calm, with room to play and grow. 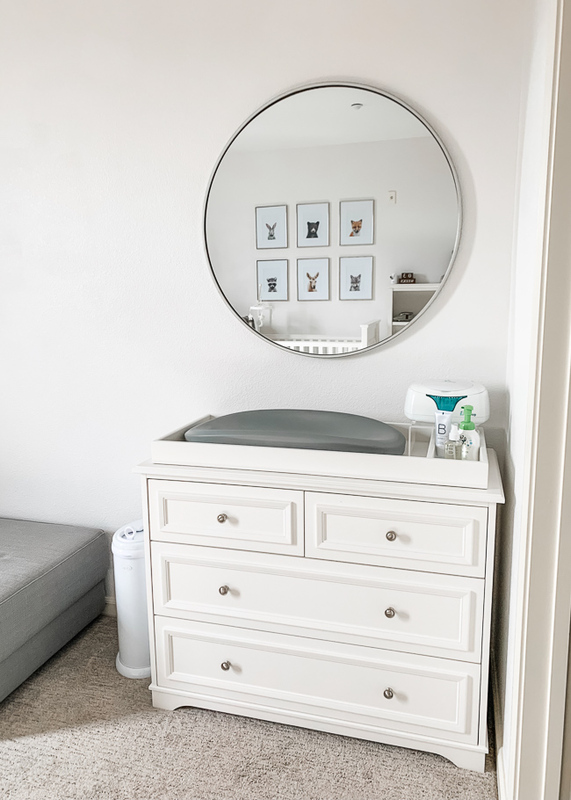 This room was previously a guest bedroom, and we wanted to keep some sort of space for guests to sleep over without taking away from the look or function of the baby's room. We also had not touched the room in terms of wall color, flooring, etc. since buying our home 2 and a half years ago, so we had our work cut out for us! First up was tearing out old built-ins, painting the walls (thanks to my husband!) and replacing the carpet. We went for a green certified brand and kept windows open for weeks to let it all air out before baby would arrive months later. Then came the fun part that also required lots of patience- the decorating! Some of the furniture was backordered, but everything came together just in time and I love how his space turned out. Get ready for lots of pictures, and lots of links to everything shown! Let me know if I miss anything! For links to bedding, clothing, baby gear, hygiene products, and more- see "My Baby Registry & Favorites" post HERE. We kept the room pretty minimal, so the bookcase was my place to add some color and personality. I love the vintage "Hudson Hornet" model car my brother bought Hudson before he was born, and the framed Golden Gate Bridge we received as a gift from the sweet girls of Watercolor By Studio R on Etsy. My plan is to change up the shelves with the seasons as Hudson gets older, and set out holiday books, decor, etc! 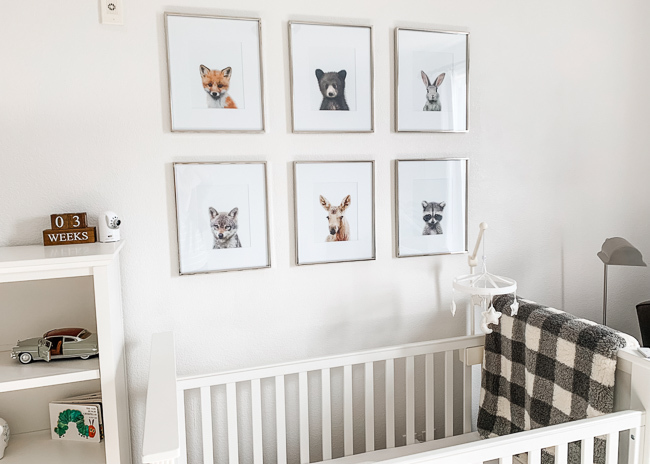 We decided to go for a subtle "woodland" theme with these adorable baby animal prints (they have a ton of other animals too!) and some pops of plaid. 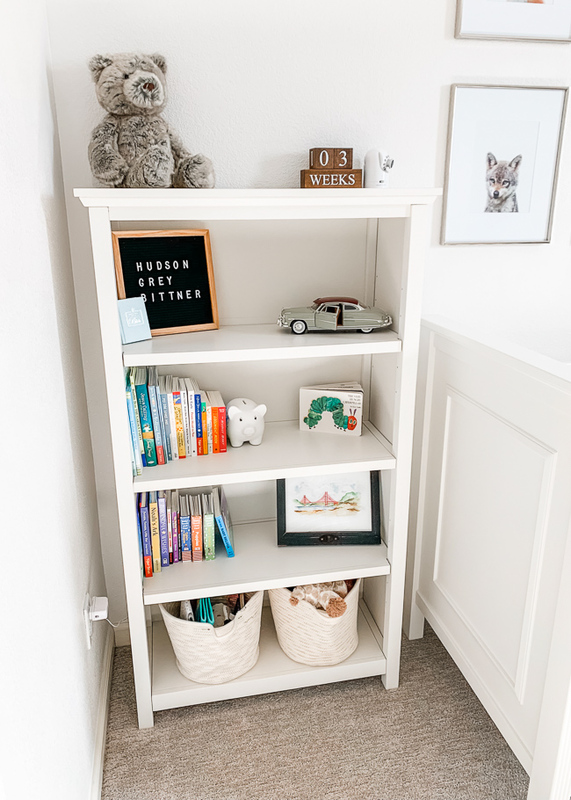 This is our "feeding & reading" corner and we already love it. It took me forever to find the right floor lamp, but it still wasn't quite perfect as I wanted something dimmable (for nighttime lighting) without having to rewire our outlets. I bought this plug-in dimmer/remote setup and love it for transforming any light! The night light / sound machine is also wonderful, and currently living in our bedroom while Hudson sleeps in our bed or his bassinet. I love how it connects to an app on my phone so I can set up favorite settings and turn it off/on remotely. This daybed took forever and a day to arrive (it was on backorder when I found it) but it was worth the wait! I love the look, but also love the functionality of it. It's a twin size as seen here, but folds out to a king! We keep bedding stored in the closet for having guests over. The play gym has already become another favorite of ours, and I love how it comes with a tent cover to transform it into a cozy little play area for when he's bigger! 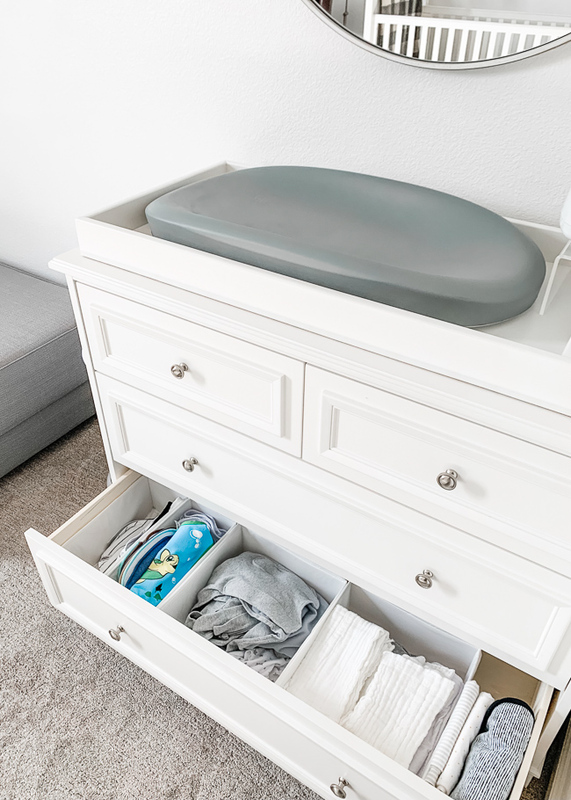 We opted for a dresser with a removable changing topper that can come off when he no longer needs it. Love the look of this line (the crib is matching) and that it's Greenguard Gold Certified- which means less harsh/toxic materials used. It also has a built-in scale which makes this anxious mama happy. 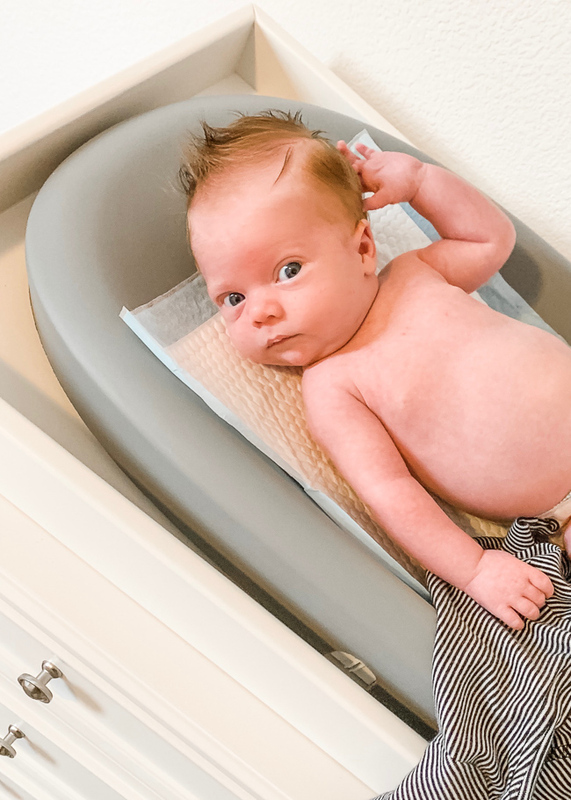 You can use it before and after breastfeeding sessions to see how many ounces baby got, or just use it weekly to track baby's weight gain. It also connects to an app where both my husband and I can login and track his progress. Love! These dividers make my organizational heart happy. 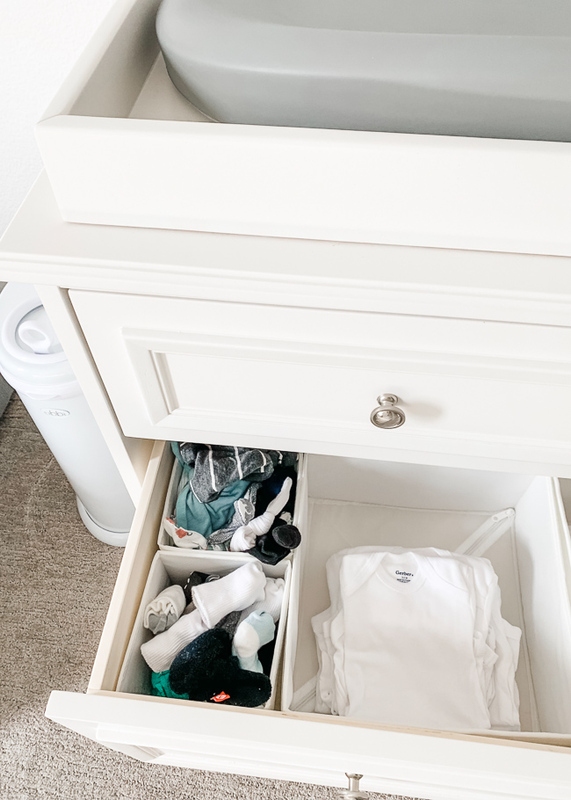 Top dresser drawer is for diapering, hygiene, and health related items, middle is for socks, mittens, hats, onesies, and pants, and bottom is for bibs, burp cloths, and small blankets. 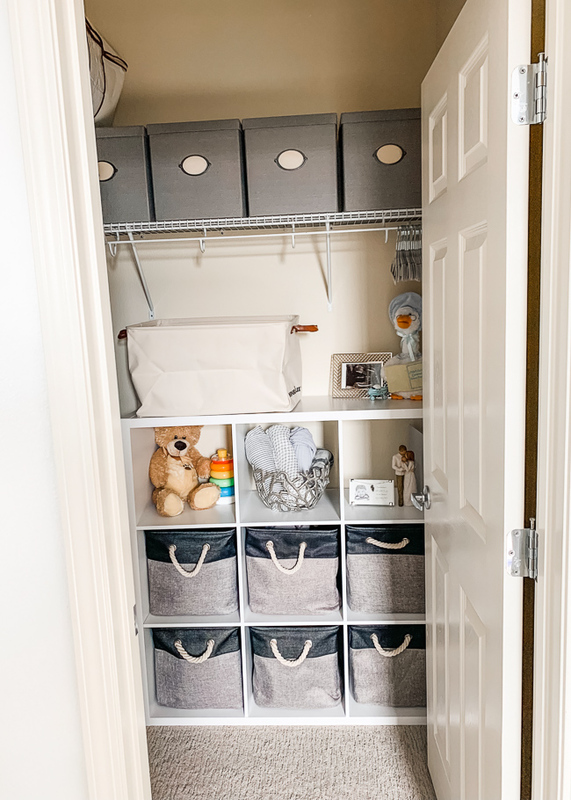 We are so fortunate to have a fairly large closet in Hudson's room, and I wanted to take full advantage of it without investing a ton of time/money in a custom storage system. 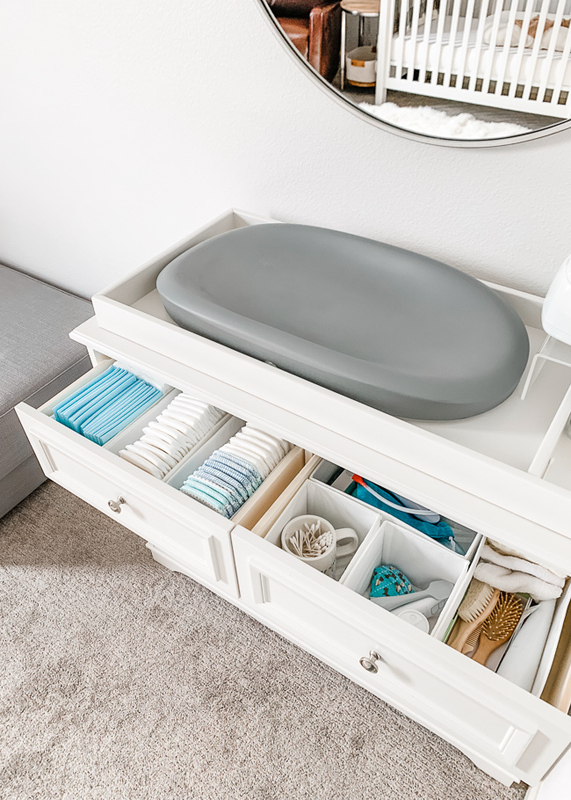 My easy answer was this cube shelf organizer with fabric bins. 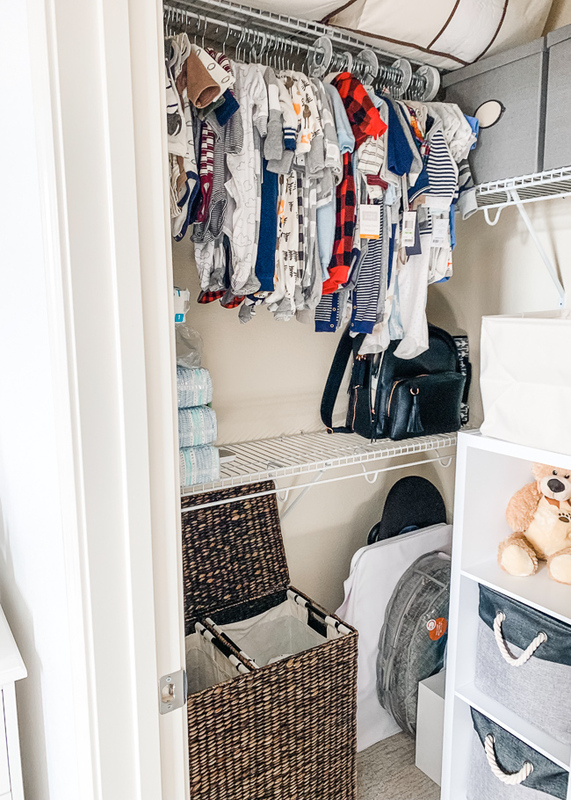 Right now we have a few full of backup items, swaddles, and baby carriers, but they will be easy to fill with toys and clothes in the future as needed! I've loved having these clothing dividers that categorize Hudson's hanging outfits by size. Below is his hamper that separates lights & darks and has pull-out laundry bags. Up top are the storage bags we use for pillows and bedding for when guests sleep over. 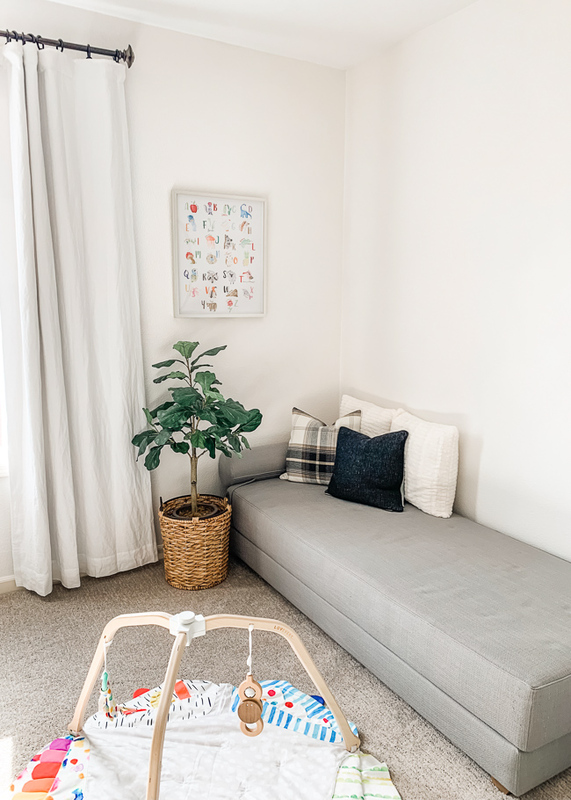 I hope you enjoyed this peek into the happiest room in our home! It's quickly become our favorite hangout spot, and I am so excited to see our little Hudson grow into it! 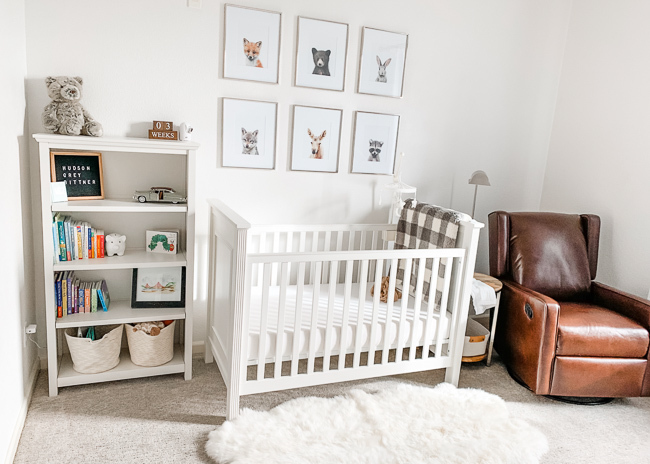 Beautiful nursery (and baby!)! I'm expecting in the spring and that leather chair is just what I'm looking for. The link isn't working though. Do you mind sharing the details? How do you like it so far? 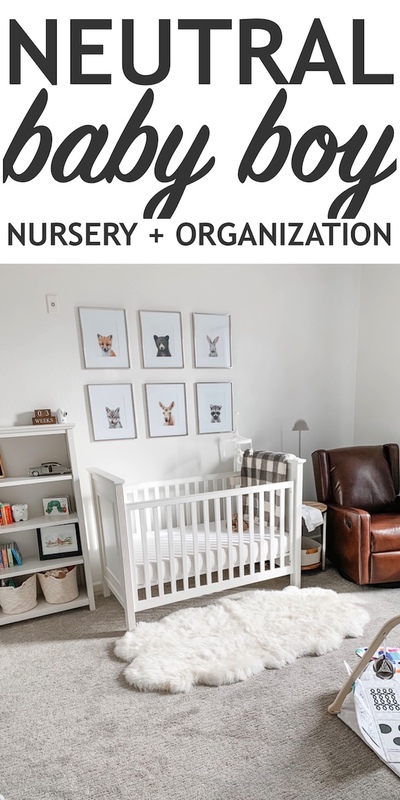 I love the nursery so clean and uncluttered. We don’t have a closet in our nursery so all of her cloths had to go in drawers. I love the idea of using the top drawers for supplies. Great job!! Oh no, it looks like it keeps going in and out of stock! Hopefully it comes back- we love it so much! It’s comfortable and so well made for such a low price. 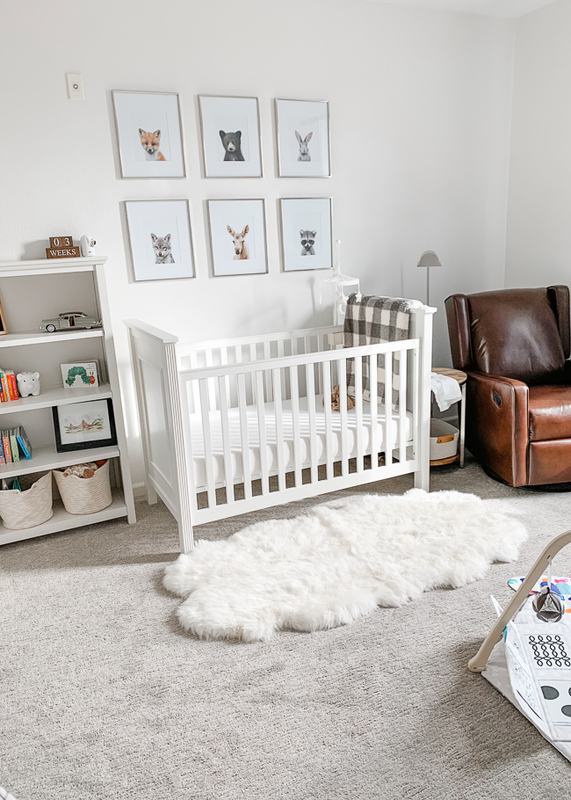 It’s from Wayfair where I linked- called the Hendersonville Swivel Recliner! Aw thank you so much Kate! The top drawer storage has been so handy. And eventually when he doesn’t need all that, he can use the space for clothes! How do you like that Sheep skin rug? It is currently in my wayfair cart but curious if you think it was worth it! I know my husband will thing that is a splurge item but it looks so cozy!